A family with a couple small children. A woman walking her dog. Not a big crowd, but they pause for a few minutes along a farm field drive, west of Solon, waiting to see if the feature attraction will show. A snow white deer has appeared most evenings for the last two weeks. At times, a dozen people stand at the top of the hill, 200 yards away. Traffic slows on the highway. Occasionally, a vehicle pulls over if the deer is visible through the roadside brush. A couple daybreak walkers and bicyclists along County F-16, east of Lake Macbride State Park, have noticed her, too. 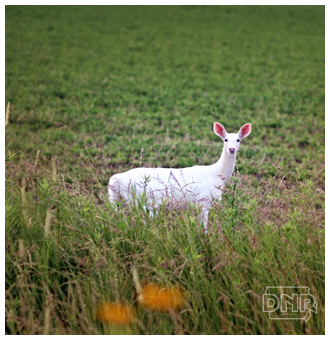 Wildlife biologists stake the odds of an albino deer at 1 in 100,000 or more. Every few years, sightings of one are reported in Iowa. Each parent must carry the recessive gene and pass it along to the fawn. There is evidence that albinism in an animal carries with it a higher prospect of developing skin or eye ailments; which could shorten its life span.